I meant to make this a picture tutorial.......but I forgot & took no pictures before or during. I am sorry. I grabbed a flower image from one of my clip art/stencil books and made it a few sizes. 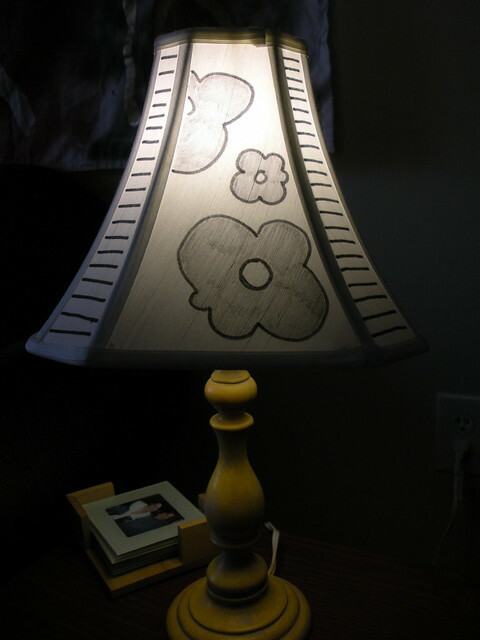 I colored charcoal on the back of the flowers & traced over them with a pencil (like carbon paper) to transfer the image. Then I outlined it in Sharpie & colored it in. I wanted it to sort of be Dr. Seuss-y & child like...which I think it fulfilled. But now it doesn't fit in my living room. Wewt! I think you totally achieved your goal of Dr. Seus-y and child-like! It's adorable! And, I love the base...is it yellow...it looks yellow..and...I love yellow! hehe.